Holding both yarns together, cast on 9 stitches. Purl every row for around 4 inches, then begin pattern. Row 1: Purl across row. Row 2: Purl across row. knitted stitch. * Repeat until end of row. End on Knit 1. Row 4: Purl across row. Repeat Rows 1-4 until scarf measures about 56 inches. Then purl every row (as you did at the beginning) until your scarf measures 60 inches. Cast off in purl. Weave in ends. 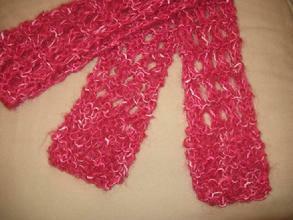 Please sign your first name on the Handmade tag and use a piece of scrap yarn to attach it to your scarf. Please return extra yarn.